DRY FARM TOMATO SEASON IS HERE! Yes! Dry farm tomato season is upon us! And the early girl organic tomatoes have arrived at $3.99/lb. Some sliced dry farmed tomatoes, fresh mozzarella, a few basil leaves, all drizzled with balsamic vinegar and evoo topped off with a pinch of salt and you’ve got yourself a meal! Fiddlehead Ferns Now In Produce! How to Prepare Fiddlehead Ferns: Boil them for 5-7 minutes, then fry them in oil or butter for 5 minutes or until tender. Simple! 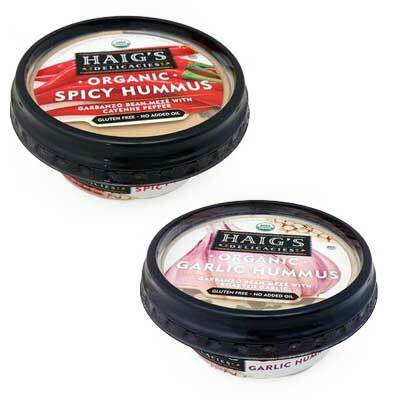 The Haig’s hummus we’ve loved for decades has now gone organic. It’s a very good look, as well as taste. You gotta try these 8oz cups of heaven.